The ladies continued their winning ways with another convincing win against Tara’s in the first round of the league. Despite the warm weather conditions they kept going and supporting each other until the final whistle. We hope that the girls will continue this winning streak this Saturday in the Tom O Connor Cup final when they take on St Anthony’s Reading. The game is scheduled to take place in Greenford at 11:00am. The lads had no game this weekend and their next fixture will be against Moindearg in the second round of the McArdle Cup. This game is also due to take place in Greenford on Saturday but will be at the later time of 3:30pm. 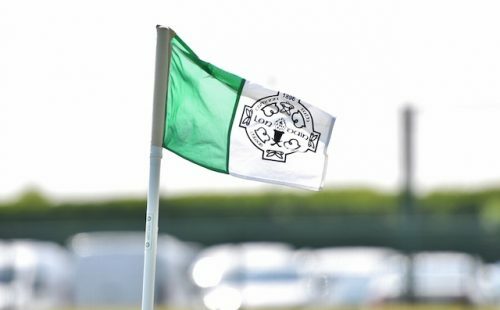 As always, we are on the lookout for new players or committee members and if you are interested in joining our welcoming club please contact Enda on 07522723765 or Mackenzie on 07398633018. The club is also pleased to announce our partnership with Keenwood Joinery. Keenwood Joinery has generously backed the club this season and have become one of the main sponsors by sponsoring a training jersey for all fully paid up members on the Men’s and Ladies team. We will be having an official launch for the jersey in the coming weeks so watch this space! Finally, the Club is hosting its annual Night at the Races on the 6th April in the Man of Kent, Nunhead, SE15 3QF. These nights have always been great fun in the past and you can buy a horse for £10 or a jockey/owner for £5. Alternatively, if you wish to sponsor a race your company name and logo will be promoted on the evening as well as on all social media platforms. If you are interested in supporting this event, please speak to any of our current players or contact Enda on 07522 723765. A thorough and clinical first half performance from Eire Óg laid the foundations for a well-deserved victory on Saturday afternoon in the preliminary round of the Intermediate Football Championship in McGovern Park, Ruislip. Opponents Tir Chonaill Gaels were missing several regular players and gave a number of debuts to new recruits that will no doubt be a great experience for them ahead of their cup and league campaigns. Early points from Caolan Conroy and some monstrous efforts from John Coyle gave Eire Óg a promising lead before Tir Chonaill Gaels answered back with two points from placed balls. With Eire Óg beginning to get on top at midfield through captain Stephen O’Keeffe and wing backs Pat Tobin and Tony Fegan, the North London side capitalised by scoring 3 quick fire goals. Jason Boles dispatched the first before Ciaran McElhinney and Conroy added further goals to put Eire Óg into a comprehensive lead at half time. Jason Boles’ second goal seemed to be the icing on the cake as far as Eire Óg were concerned but a powerful finish into the Eire Óg net seconds before the end took a little bit of shine off the result. Mc Aleer and Rushe Murphy Cup Vs St Brendans in Greenford at 2pm on Saturday 6th April. After an opening day win vs CuChullains, the lads will look to move closer to a semi final position on Saturday afternoon. Our first fundraiser of the year will take place on Saturday April 6th at the Sheephaven Bay, a short walk from Mornington Crescent station (NW1 7QD). We are hosting a Quiz Night which is bound to be a great social night for players and non-players alike. If you are interested in testing your general knowledge, we would love you to come along. If you want any more information or wish to be set up in a team, please message our Facebook or Twitter page or contact someone from the committee. 24/03/19 2018 Ronan Cup Final, Ruislip. Fr. Murphys 2-11 Thomas McCurtains 2-11. An intriguing contest for the first game of the year, both teams served up a very good spectacle and in the end a draw was a fair result. Fair play to both clubs for playing out another gripping game. The club will be back training within the next two weeks. Please check our social media accounts for updates. Half zips (£39) and bags (£30) are available to order. Please contact club secretary Seán Howlin if you would like to order. Tickets and money must be in by the next meeting on 12th April please. There are still some available: £40 per ticket, which enters you into 3 draws April, May & June. Each draw has fantastic prizes starting with a car or €15,000, electrical goods and smaller cash prizes. A great draw, if you would like to enter, please contact a club member. Want to play GAA in London in 2019? Fr. Murphy’s is the club for you! Senior Hurling, Camogie, Ladies Gaelic football teams and underage teams. Based in in West London we’re easily accessible via public transport. We have good training facilities and a fantastic social scene. Please search Fr. Murphy’s on social media for regular updates. Contact us via email (frmurphyshurling@gmail.com) or Hurling; Jim – 07932 723780. Ladies; Larry – 07944 178879. Underage; Martin – 07960 503355. The Club enjoyed a fabulous evening as they celebrated together at their annual dinner dance at The Claddagh Ring in Hendon. We would like to thank all the guests, players, families and friends, the Murchu Duiginn School of Irish Dancing for their wonderful display, Brendan Vaughan for his photography skills, Barry Owen for the best music and vocals and Finbar and his staff for their help, great food and professionalism of service. Congratulations to the recipients of awards, Ryan Forde (Senior Players’ Player and Senior Club Player 2018 and Veronica Bailey (Club Person 2018), well deserved. The different youth teams will commence outdoor training shortly during the Easter holidays and after at Harrow Rugby Club. However, training for the U17, Junior and Senior teams continues on a Thursday from 7-8pm at Preston Manor School. Contact Tony Griffin (07966 160999) or Dennis Diggins (07768 352680). New players welcome. Please note memberships now due for everyone. Moindearg gave us a walkover in the preliminary junior championship on Sunday. Training for our seniors continues on Tuesdays and Thursdays in Brunel. We would also like to congratulate club stalwarts Paddy Donaghy and John McDermott who represented the club in the London Masters panel who travelled to New York to play the NYPD. We are excited to start back with all our youth teams this week for the new season. Training will be starting at 6.30 so we can make the most of the daylight. Will recommence on Thursday evening at 6.30. U17 development league continues next Saturday at 3.30 in Greenford. Please follow our Facebook and Twitter pages for regular updates. Training starts 5th April for boys and girls ages 5 to 16 from 6.30pm to 8.00pm @ Tara Park Northwick Park playing fields, the Fairway Wembley, HA0 3TG. Everyone Welcome. Good luck to all the Tara girls and boys attending the Féile trials. The 2018 North London Féile team will play Summerhill, Co Meath at 7:30 pm in Ealing Trailfinders on Friday April 5ft. On Saturday April 6th there will be a U15 tournament at TCG – all clubs invited to enter teams. Our official club merchandise is available to order on the O’Neills website. New Players New players are always very welcome to join our friendly club. If you would like to join please do not hesitate to contact us below. We would be delighted to hear from you. Well done to Grace Donaghy, Demi Mcdaid, Caitlin Jones, Megan Jones, Roisin Kelly, Caragh O Leary, Orla Tighe and Holly Lynott, who played for the London Ladies U15 in Wexford at Ferns centre of Excellence on Saturday. The girls had a fantastic day playing against Galway, Dublin and Wexford and came out victorious against the hosts Wexford. Best of luck to our U17 boys who teamed up with Taras to participate in the U17’s Development League. The league runs for another 2 weeks and concludes with a Final day on 13th April. League R3 – TCG Ladies 2-6 to 3-14 Holloway. Our Seniors received a walk over from Fulham Irish in their proposed Championship Preliminary game yesterday. Our Young Guns had a tough introduction to their new home of intermediate as they played Eire Og in glorious conditions on Saturday afternoon in Ruislip. A slow start from the Gaels saw Eire Og punish several sloppy mistakes as they raced into a insurmountable lead that left the half time score at 3-10 to 0-3. A much better second half saw the Gaels up their game with 2 goals from Rory Jennings to help lift the spirits on what was otherwise a day to forget. Final score – Eire Og 4-18 TCG Intermediates 2-5. Tipperary Cup – TCG Seniors vs North London Shamrocks, Saturday 6th @ 3.30pm in Greenford. Murphy Cup – TCG Intermediates vs Garryowen. Saturday 6th @ 5pm in Greenford. No jackpot winner this week. Lotto draw winners: Calum Crowley, David O’Donnell & Clive Mills. Please keep playing online @ http://www.tirchonaillgaels.com/lotto. We have a massive week ahead this week with our Football season starting against Dunedin Connollys. This is our first competitive game of the year, this Saturday with a 1.30 throw in at Broughton Rugby Club, 109 Granton Road, EH5 3NU. This is the first test for our new Management team and we would appreciate if as many club members as possible travel to show the lads support. For further details please contact the management team on 07746398669. Seniors are training at GHA Rugby Club on Monday and Thursday at 7pm. Camogie are training at Glasgow green this week. At the pirate park at Greendyke street. For more information please contact Courtney on 07880343407. No underage training this week with the schools being closed.